Anyone with space issues will appreciate roller garage doors, which feature a compact door design and easily fit most garage structural openings. With top mounts and guide rails for the door, these offer many benefits. They provide high levels of security, operate smoothly and quietly, require no frame, feature a versatile design which allows them to be installed in a variety of configurations, and save space inside the garage as well as on the driveway. 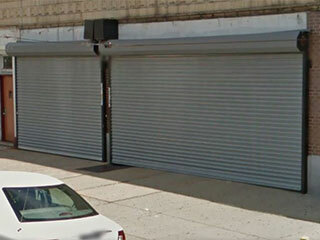 Cars can park right up against these doors without hindering their opening or closing. . Homeowners love the roller door's simplicity; all it has are the guide rails, motor, and the casing for the door. Available in manual or electric operation as well as a battery system in times of power failures, roller doors roll swiftly and neatly into the overhead panel when not in use and simply roll down as needed. They are made from horizontal hinged sections that enable the door to wrap around a cylinder which turns in one direction to lift the door and in the other direction to lower it again. They are available in many designs and specifications and can be designed to your home's individual requirements. Roller garage doors have many different applications and are found in residential homes, warehouses, or other commercial buildings. With roller doors you receive a selection of counterbalance springs and reduction gears to suit various door sizes, and operation can be electric, manual hand chain, self coiling or gearbox mechanism. Roller garage doors are made from thick aluminum lath. As the basic material for production of roller doors, aluminum resists corrosion, and copes well with temperature fluctuations. With insulated roller doors the curtain of the door is made of individual sections which interlock to form a single curtain. Most insulated doors are automated as standard and the safety requirements are stringent with the door being fitted with a bottom rail safety edge. Life is complicated enough; if you're in the market for an easier solution for convenient garage doors, the simplicity and reliability of the roller garage door make it a great option.